If you want a beautiful smile, you may want to consider orthodontic enhancement before considering the option of veneers or crowns, Adults seeking cosmetic changes can be well advised to consider aligning the teeth first to reduce excessive grinding of the teeth during the cosmetic procedure. A Fast and predictable option to traditional Orthodontics can be found on our section for Fastbraces. 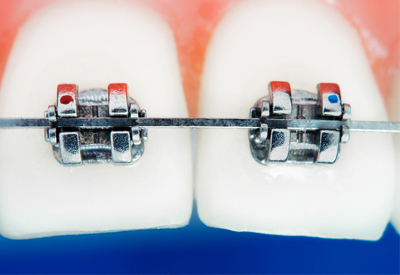 Braces work by placing a constant, gentle force upon the teeth in a carefully controlled direction. The braces slowly move the teeth to the correct position. The technology in orthodontics has greatly improved over the years. Today's braces are clear or metallic in color and can be made of a variety of materials such as metal, ceramic, or plastic. The wires that are used are far less noticeable than they used to be and, because they use the latest materials, are able to move the teeth far faster and with less discomfort than they previously could. Treatment duration varies from patient to patient, however it typically ranges from twelve to thirty months. Factors that impact the duration of treatment include the growth of the patient's jaws and the severity of the problem. And because patients grow at different rates, the response to orthodontic treatment may vary between patients. Treatment duration can also be impacted by a patient's diligent use of prescribed rubber bands. The orthodontist and the patient must work as a team in order to complete treatment as quickly as possible!